The problem with Shakespeare and Venus is that on many of the occasions when Venus is referred to in his plays, poems and sonnets it is as the goddess of love. Venus and Adonis is one of Shakespeare's greatest poems and it has been adapted many times as a stage play and even set to music. Inspiring as it may be, there is not a lot of astronomy here. However, in Act two, Scene three of 'A Midsummer Night's Dream' there is no room for uncertainty as Demetrius clearly says "So should the murdered look, and so should I, Pierced through the heart with your stern cruelty. Yet you, the murderer, look as bright, as clear, as yonder Venus in her glimmering sphere". Sphere is quite an unusual word for Shakespeare to have used. It rhymes with "clear" but Shakespeare was such a master of English that he could have easily have used another coupling. Shakespeare even invented and used about 1700 of his own words when the vocabulary of the time was insufficient to describe on paper the subjects of his imagination. Depending on its position relative to Earth, Venus subtends an angle of 40 arcseconds to 66 arc- seconds to the Earthbound viewer. The normal limit of perception for human vision to determine shapes is about 60 arcseconds (about two pixels see http://www.clarkvision.com/articles/eye-resolution.html). Would a Tudor astronomer really have seen Venus as a sphere with just the unaided eye? They would have had to have been blessed with much better than average eyesight to do so. I have been looking at the night sky for over 50 years but I must confess I have never seen Venus as anything other than a single very bright point of light in the early morning or evening. However, through the Tudor telescope it is possible to get a clearer image of Venus. I took the image below on September 12th at 6am when Venus was at 0.866 phase. The sky was in bright twilight which reduced the contrast but enabled a clearer, slightly darker image of the planet to be viewed. 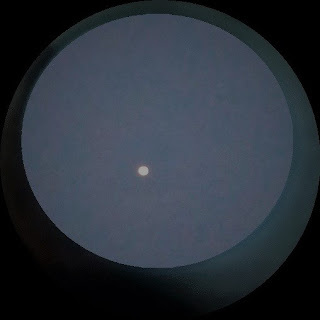 Through the modest 3X magnification of the Tudor telescope Venus appears as a sphere. There are no surface details but Shakespeare's "glimmering sphere" is a perfect description of what I could see. Could Shakespeare have looked though a Tudor telescope and seen an image like this? It's possible but it is far more likely that he got this information from someone else who had used a telescope and seen Venus for themselves. There are several possible candidates but the most likely one I think is Thomas Digges.